Learn the complete process of teaching your child to round off numbers to the nearest tens, hundreds and thousands. 34,256 people visited the Zoo on Monday. 10,762 more people visited the Zoo on Tuesday than Monday. How many people visited the Zoo on Tuesday? 34,000 people visited the Zoo on Monday. 11,000 more people visited the Zoo on Tuesday than Monday. How many people visited the Zoo on Tuesday? This makes the question easier to understand. The easiest way to learn about rounding off numbers is to use place value and a number line. Click here to learn about Place Value. The main goal in rounding off to the nearest ten is to ensure the last 2 digits of the number ends in either 00, 10, 20 .... or 90. I will show you 3 examples. The method can be applied to any number larger than 10. I will use the number 74 to illustrate. The digit 7 is in the tens place so 74 will become either 70 or 80 after rounding off to the nearest ten. 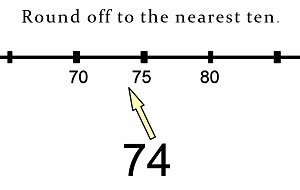 Now we try to figure out if the number 74 is smaller than or bigger than 75 on the number line (is it to the left or to the right of 75). If it is smaller than 75, we round it off to 70 (round down). If it is 75 or bigger, we round it off to 80 (round up). Since 74 is smaller than 75, we round down to 70. Click here for Rounding Off Numbers cards to practice. Let's now consider the number 65. Do you think it will round down to 60 or round up to 70? That's right, it will round up to 70. This means that all the numbers between 65 and 74 will round off to 70 when rounded to the nearest ten. Need to take a break? Check out these games. Let's look at rounding off a 3-digit number to the nearest ten. I will use the number 144 to illustrate. Underline the last 2 digits - 144. The digit 4 is in the tens place, so 144 will become either 140 or 150 after rounding off to the nearest ten. 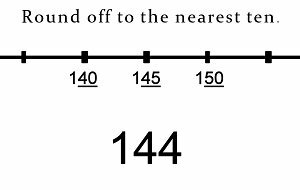 Now we try to figure out if the number 144 is smaller than or bigger than 145 on the number line (is it to the left or to the right of 145). If it is smaller than 145, we round it off to 140 (round down). If it is 145 or bigger, we round it off to 150 (round up). Since 144 is smaller than 145, we round it down to 140. Do you know what is the smallest 3-digit number that will round off to 140 when rounded to the nearest ten? That's right, it's 135. So all the numbers between 135 and 144 will round off to 140 when rounded to the nearest ten. A number is rounded off to 700 when rounded to the nearest ten. What is the smallest possible number it could be? First we draw a number line with the number 700. Since we are rounding off to the nearest ten, we add in the numbers that is 10 less and 10 more than 700. Remember to leave a space between the numbers. Now we add in the numbers at the halfway points. 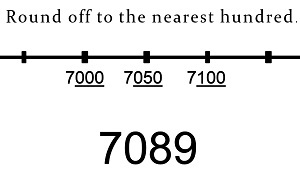 From the number line we can see that the smallest possible number that will round off to 700 when rounded to the nearest ten is 695. To check our answer, we round off 694 to the nearest ten. We will get 690 not 700. So 695 is the correct answer. Can you find the biggest number that will round off to 700 when rounded to the nearest ten? Do you know what are the range of numbers that will round off to 700 when rounded to the nearest ten? The method is the same for rounding off a 4-digit number to the nearest ten. I will use the number 2106 to illustrate. Underline the last 2 digits - 2106. 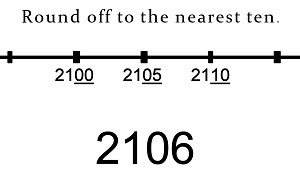 The digit 0 is in the tens place, so 2106 will become either 2100 or 2110 after rounding off to the nearest ten. Again we draw a number line with 3 numbers on it: 2100, 2105 and 2110. Ask ourselves "Is 2106 smaller than or bigger than 2105 ?" (is it to the left or to the right of 2105). If it is smaller than 2105, we round it off to 2100 (round down). If it is 2105 or bigger, we round it off to 2110 (round up). Since 2106 is bigger than 2105, we round it up to 2110. The main goal in rounding off to the nearest hundred is to ensure the last 3 digits of the number ends in either 000, 100, 200 .... or 900. I will show you 2 examples. The method can be applied to any number larger than 100. I will use the number 712 to illustrate. 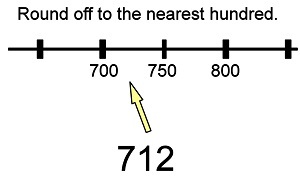 The digit 7 is in the hundreds place, so 714 will become either 700 or 800 after rounding off to the nearest hundred. Same as before, we try to figure out if the number 714 is smaller than or bigger than 750 on the number line (is it to the left or to the right of 750). If it is smaller than 750, we round it off to 700 (round down). If it is 750 or bigger, we round it off to 800 (round up). Since 714 is smaller than 750, we round down to 700. I will use the number 7089 to illustrate. Underline the last 3 digits - 7089. The digit 0 is in the hundreds place, so 7089 will become either 7000 or 7100 after rounding off to the nearest hundred. Again we draw a number line with 3 numbers on it: 7000, 7050 and 7100. Ask ourselves "Is 7089 smaller than or bigger than 7050 ?" (is it to the left or to the right of 7050). If it is smaller than 7050, we round it off to 7000 (round down). If it is 7050 or bigger, we round it off to 7100 (round up). Since 7089 is bigger than 7050, we round it up to 7100. When you want to round off a number, underline the digits starting from the place you want to round off to. This makes it easier for your child to see the relevant digits to change. What is the smallest number that rounds off to 4570 when rounded off to the nearest ten? 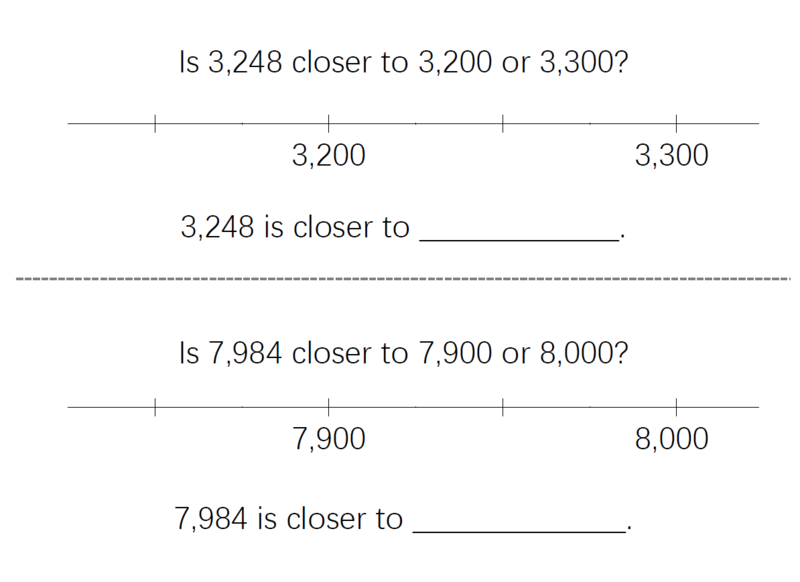 Check: If we round off 4564 (a number that is 1 smaller than our answer) to the nearest ten, we get 4560, not 4570. What is the largest number that rounds off to 1090 when rounded off to the nearest ten? What is the smallest number that rounds off to 300 when rounded off to the nearest hundred? What is the biggest number that rounds off to 10,000 when rounded off to the nearest thousand?